An amazing anthology of 250 songs sung by the Industrial Workers of the World union to educate, agitate, and emancipate workers. In 1905, representatives from dozens of radical labor groups came together in Chicago to form One Big Union—the Industrial Workers of the World (IWW), known as the Wobblies. The union was a big presence in the labor movement, leading strikes, walkouts, and rallies across the nation. And everywhere its members went, they sang. Their songs were sung in mining camps and textile mills, hobo jungles and flop houses, and anywhere workers might be recruited to the Wobblies’ cause. 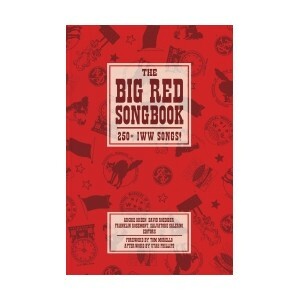 The songs were published in a pocketsize tome called the Little Red Songbook, which was so successful that it’s been published continuously since 1909. 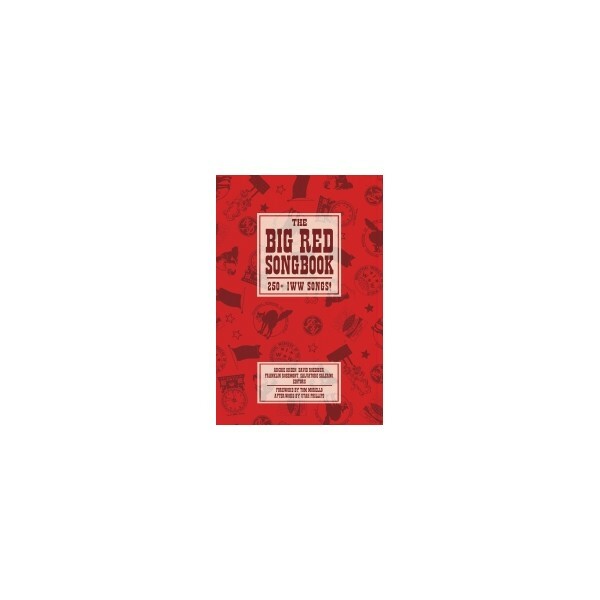 In The Big Red Songbook, the editors have gathered songs from over three dozen editions, plus additional songs, rare artwork, personal recollections, discographies, and more into one big all-embracing book. IWW poets/composers strove to nurture revolutionary consciousness. Each piece, whether topical, hortatory, elegiac, or comic served to educate, agitate, and emancipate workers. A handful of Wobbly numbers have become classics, still sung by labor groups and folk singers. They include Joe Hill’s sardonic “The Preacher and the Slave” (sometimes known by its famous phrase “Pie in the Sky”) and Ralph Chaplin’s “Solidarity Forever.” Songs lost or found, sacred or irreverent, touted or neglected, serious or zany, singable or not, are here. The Wobblies and their friends have been singing for a century. May this comprehensive gathering simultaneously celebrate past battles and chart future goals. In addition to the 250+ songs, writings are included from Archie Green, Franklin Rosemont, David Roediger, Salvatore Salerno, Judy Branfman, Richard Brazier, James Connell, Carlos Cortez, Bill Friedland, Virginia Martin, Harry McClintock, Fred Thompson, Adam Machado, and many more. Archie Green (1917–2009) was an American folklorist specializing in laborlore (defined as the special folklore of workers) and American folk music. Devoted to understanding vernacular culture, he gathered and commented upon the speech, stories, songs, emblems, rituals, art, artifacts, memorials, and landmarks which constitute laborlore. He is credited with winning congressional support for passage of the American Folklife Preservation Act of 1976, which established the American Folklife Center in the Library of Congress. David Roediger is Kendrick Babcock Chair of History at the University of Illinois. Among his books are Our Own Time: A History of American Labor and the Working Day (with Philip S. Foner), How Race Survived U.S. History: From Settlement and Slavery to the Obama Phenomenon, and The Wages of Whiteness: Race and the Making of the American Working Class. He is the editor of Fellow Worker: The Life of Fred Thompson, The North and Slavery and Black on White: Black Writers on What It Means to Be White as well as a new edition of Covington Hall’s Labor Struggles in the Deep South. His articles have appeared in New Left Review, Against the Current, Radical History Review, History Workshop Journal, and The Progressive. Franklin Rosemont was born in Chicago in 1943. His father, Henry, was a labor activist, and his mother, Sally, a jazz musician. He edited and wrote an introduction for What Is Surrealism? Selected Writings by André Breton, and edited Rebel Worker, Arsenal/Surrealist Subversion, The Rise and Fall of the Dill Pickle, and Juice Is Stranger than Friction: Selected Writings of T-Bone Slim. With Penelope Rosemont and Paul Garon he edited The Forecast Is Hot! His work was deeply concerned with both the history of surrealism (writing a foreword for Max Ernst and Alchemy: A Magician in Search of Myth) and of the radical labor movement in America. For several decades he and Penelope Rosemont combined such interests helming the venerable radical publishing house the Charles H. Kerr Co. He died in 2009 in Chicago. Tom Morello is an original member of the rock bands Rage Against the Machine and Audioslave, two artists responsible for multiple Grammy Awards and a combined 30 million albums sold worldwide. In 2007, he released his first solo album, One Man Revolution, as The Nightwatchman. Extremely active in the Occupy Movement, Morello performed at Occupy Wall Street and also made appearances at Occupy sites in London, Los Angeles, Vancouver, Seattle, and San Francisco. Utah Phillips (1935–2008) was a labor organizer, folk singer, storyteller, poet, and the “Golden Voice of the Great Southwest.” He described the struggles of labor unions and the power of direct action, self-identifying as an anarchist. He often promoted the Industrial Workers of the World in his music, actions, and words. Wake up! Long Hours, Poverty, Wage Slavery, Join the IWW.